Motivated by the May 2013 challenge in the watercolor group of the site "Paint my Photo", I've been painting some small watercolors of birds. 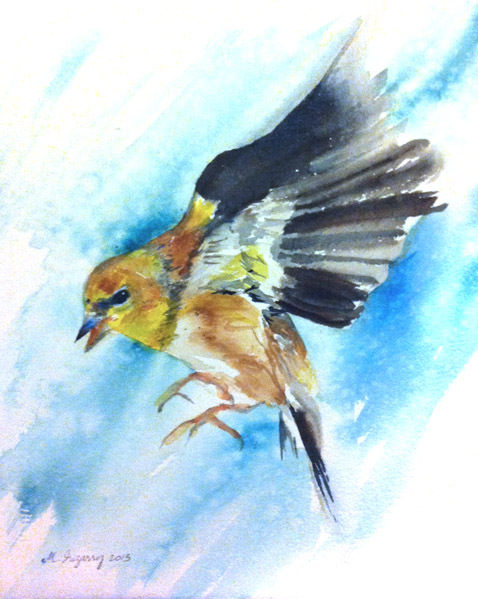 The challenge was to paint a male goldfinch in a loose way...and I tried, but I'm just a tight painter...actually, I try to be at a point mid-way between loose and tight and I like both extremes: loose almost abstract paintings and photo-realistic paintings. Each of the paintings below is 8x10 inches on Arches 140 lb. watercolor paper. I will say that although Arches is a decent paper, it is not my favorite. I especially dislike its "wet dog" smell when it gets wet (apparently due to its use of animal-based gelatin). My favorite paper of all time is Fabriano Artistico extra-white. Some people have recently recommended Saunders Waterford and Bockingford (wood-pulp based) so I'll have to try them at some point.